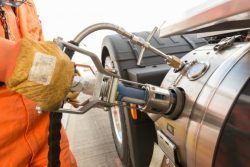 Gasrec Ltd, a pioneer of Bio-LNG (liquefied landfill biomethane) for transport fuel, is now offering commercial vehicle fleets operating in the UK the ultimate fuel choice for long distance trucking: Renewable Transport Fuels Obligation (RTFO)-certificated biomethane. This offer of certified renewable gas fuel is a first for the UK. Natural gas-powered trucks typically see CO2 savings of around 15 per cent for long-distance motorway work, 10 per cent for regional missions and 5 per cent for urban applications, versus an equivalent Euro 6 diesel. But when fuelled with biomethane, CO2 reductions are as high as 80 – 95 per cent, depending on the mission. James Westcott, Chief Commercial Officer of Gasrec, says: “Until now, if you were a heavy truck operator and wanted to get the best carbon saving for your fleet, you needed to run a 40-tonne 4×2 tractor on grid-connected CNG and get biomethane credits. Gasrec has secured biomethane-linked CO2 savings on an RTFO-certification basis for LNG arriving into the UK through National Grid on the Isle of Grain. The RTFO scheme is administered by the Department of Transport to encourage the use of renewable fuels in the transport sector. Qualification under the RTFO programme ensures fuel is from renewable sources and allows the reporting of CO2 savings by vehicle operators. This makes it ideal for fleets wanting to maximise their sustainability in a similar way to domestic users buying renewable electricity through the Green Energy Supply Certification Scheme. The fuel which goes into the vehicle will not change, but certification ensures all gas sold is matched by biomethane, and that the same kilogram of biomethane is not being sold twice. As well as reducing CO2 output, a truck running on natural gas is cleaner and quieter than a comparable Euro 6 diesel. In July 2018 the government set out new measures to clean up road transport in its Road to Zero industrial strategy. 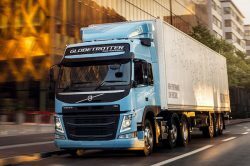 This included the introduction of a new voluntary industry-supported commitment to reduce HGV greenhouse gas emissions by 15 per cent by 2025, versus 2015 levels. In the Autumn Budget 2018, the Chancellor announced that the government will maintain the difference between alternative and main road fuel duty rates until 2032 to support the decarbonisation of the UK transport sector, subject to review in 2024. This provides the perfect environment to support operators making the transition to natural gas. With dual fuel vehicles having provided the basis for gas in transport, the arrival of the new OEM gas-dedicated vehicles will be a catalyst for major market growth. The new vehicles extend the range to cover 6×2 vehicles and have power of up to 460hp. These OEMs include Volvo, Iveco, Scania and Mercedes-Benz.